In January 2013, after more than a century as a national monument, Pinnacles became America’s 59th and newest national park. It’s known for its beautiful, towering, rocky pinnacles and dank talus caves, and it’s also a haven for birds. More than 30 miles of trails take visitors along gurgling creeks, through dense cottonwood forests and oak groves, and through the craggy pinnacles in higher elevations. My favorite hike is the 9.3-mile North Wilderness Trail Loop located in the eastern half of the park. It leads to the column-shaped rock formations that give the park its name. Chuck Graham is a writer and photographer who writes often about birds in California. He also wrote about Carpinteria Salt Marsh, Carpinteria, Hotspot Near You No. 116, Soda Lake, Bakersfield, No. 123, Oso Flaco Lake Natural Area, Guadalupe, No. 138, Cachuma Lake Recreation Area, Santa Barbara, No. 151, Elkhorn Slough, Moss Landing, No. 154, Mendocino Headlands State Park, Mendocino, No. 167, and Hearst San Simeon State Park, Cambria, No. 185. 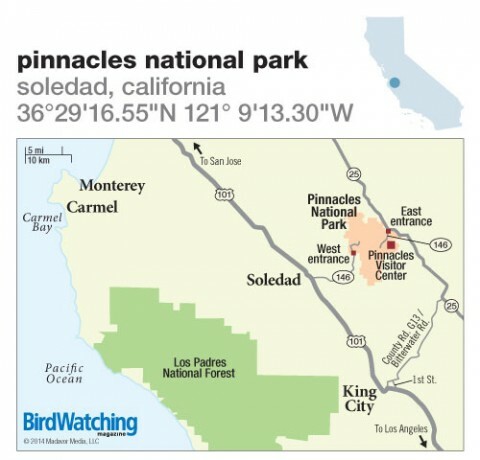 Pinnacles National Park protects 26,600 acres in the Central Coast Range. To reach the west entrance, take north- or southbound Hwy. 101 to Soledad and head east on Hwy. 146 for 14 miles to the park. To reach the east entrance, take Hwy. 101 to King City and follow Bitterwater Rd. to Hwy. 25. Turn left, go 15 miles to Hwy. 146, and turn left. Riparian corridors, creeks, and oak, cottonwood, and sycamore groves. At higher elevations, chaparral, sheer cliffs, and rocky spires. Flat along trails surrounding visitor center; some trails wheelchair-accessible. Steeper and rockier at higher elevations. More than 180 species. California Condor, Prairie and Peregrine Falcons, Turkey Vulture, Red-shouldered, Red-tailed, Sharp-shinned, and Cooper’s Hawks, Golden Eagle, Wild Turkey, Acorn, Hairy, and Nuttall’s Woodpeckers, Northern Flicker, Band-tailed Pigeon, Greater Roadrunner, Loggerhead Shrike, California Quail, Bewick’s and Canyon Wrens, Oak Titmouse, Chestnut-backed Chickadee, Bushtit, Wrentit, Dark-eyed Junco, Pacific-slope Flycatcher, Black Phoebe, Steller’s Jay, Western Scrub-Jay, Yellow-billed Magpie, White-throated Swift, White-breasted Nuthatch, Western Tanager, Red-winged Blackbird, Spotted and California Towhees, Lesser and Lawrence’s Goldfinches. Visitor center, campground, general store, drinking water, RV sites with electrical hookups, shuttle bus service, educational programs. National park. $10 admission fee valid for seven days. Annual pass $20. Note that Hwy. 146 is not a through road; no road connects the park’s east and west entrances. Bring a spotting scope. Dress in layers and bring a windbreaker and warm hat. Wear good hiking boots or trail shoes. Pinnacles Visitor Center, (831) 389-4485.